Whether you are new to the area, an established community member with students already enrolled and active, or just now enrolling a kindergarten student, we welcome you to Cuyuna Range Elementary School. With preschool through sixth grade classes, it is our goal to nurture, direct and help each child reach his or her full potential. Enrollment at CRES is approximately 620 students with 100 staff members. The school is arranged in a "pod" system, with each pod housing a grade level and specialist classrooms. We have a library chock full of children's books, two full size gymnasiums, three computer labs, a music room, a band room, a newly upgraded playground and most importantly a dedicated staff that cares for each and every child. We encourage you to get involved and support our school's mission of fulfilling the promise of educating each child in a safe and nurturing environment. Contact the school office if you'd like to volunteer or schedule a tour of our wonderful school. At Crosby-Ironton High School we take pride in our high academic standards and rigorous curriculum, as well as the social and athletic aspects of our fine school, always reaching into the future and embracing new ideas. From interesting electives to our college level courses, our students enjoy a diverse curriculum taught by experienced professionals dedicated to providing the best education possible.Eligible juniors and seniors have a unique opportunity to earn high school and college credit simultaneously by enrolling in the College-in-the-Schools program. C-I instructors teach these courses, and credit is earned through Central Lakes College in Brainerd. Students benefit through their involvement in school life; therefore, a strong emphasis is placed on student participation in activities beyond the classroom. Whether in sports, clubs or community projects, our young men and women know the value of educating the whole person. Rippleside Elementary School serves grades Pre-k to 6 and students in grades 7-12 attend Aitkin High School. 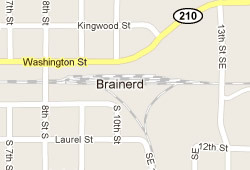 Brainerd Public Schools, Independent School District (ISD) 181 serves the public education needs not only the interconnected twin cities of Brainerd and Baxter, but also the vast majority of the other smaller communities in the Brainerd Lakes Area. According to the ISD 181 website, about 6,800 Pre-K-12 students in the Brainerd Lakes Area attend Brainerd Public Schools. The school district covers the communities of Baxter, Pine Center, Nisswa, Merrifield and Garrison, as well as every township in the area. ISD 181 has an exceptional reputation for its technology programs, which is evident in the impressive online magazine it produces called "We Are 181.” This comprehensive and colorful periodical covers everything from adult education classes and afterschool programs available to feature-length articles on how to handle bullying and profiles of life in the world beyond school. In addition to the vast number of adult community education options offered through Brainerd Public Schools, there are several institutes of higher learning in the Brainerd Lakes Area. In Brainerd itself, you have Central Lakes College, a community and technical college with an average full-time enrollment of 2,341. Students at Central Lakes College can earn an associate’s degree in a variety of programs like theatre performance, applied engineering technology, and communication art and design.